Originally, everyone spelled it centre, but because of Noah Webster's spelling reforms, people in the US started spelling it center, particularly in the last century. Although the revised spelling center has been adopted internationally to varying extents, centre is still more popular in most regions. But regardless of how you spell it, it's the same word, so it has the same meaning either way. As you can see, center is more popular in the US, while centre is more popular in the UK. Many regions fall closer to the center of the spectrum, with India favoring centre only somewhat, and Hong Kong using both spellings in roughly equal proportions. Overall, centre is more popular in international English. Which should you use? Well, if you're required to follow a style guide, use whichever spelling it suggests. If you have a choice, and you're writing in a region like the US or UK that strongly prefers one spelling, I suggest you use that spelling. (I don't think either spelling is ever "incorrect", but it's possible that the person grading your test might disagree with me!) Otherwise, you can spell it however you like. Finally, I'd like to add one note about the percentages above. The tendencies at the top and bottom ends of the chart are likely to be stronger than the percentages indicate, primarily because spellings are usually respected in proper nouns regardless of region. If you talk about the Capital Centre, for example, you're likely to spell the word centre rather than center regardless of which region you're in. But since most uses of this word are not in proper nouns, the percentages should be roughly accurate, particularly toward the center of the list; it should be enough for you to decide how to spell the word. Centre is correct in international and British English. Center is an alternative spelling used mainly in American English. I'm Australian, so the following refers to British/Australian/New Zealand spelling and also for most Commonwealth (ex-British Empire) countries too. The spelling of these two words is different depending on it's meaning. If it is referring to the middle of something, such as the middle of a circle or in fact any shape, then the spelling is CENTER. An example is "I walked to the center of the circle". If the word is referring to an organisation or a building, then it's spelt as "CENTRE". An example would be "I started my new job at the Australian Centre for International Relations" or another example would be "the music score was deposited at the University Music Centre". As for "meter" vs "metre" the spelling is also different depending on what it's referring to. An instrument of measurement is spelt "METER" - example: the gas meter or the water meter. If it's referring to distance it's "METRE" - example: "the 100 metre sprint" or "the steel pipe was 20 centimetres long". Also the metric measurement of volume is spelt "LITRE". The United States spells it as "liter", everybody else (I believe) spells it as "litre". In the US the spelling for both "meter / metre" is just "meter". I hope this is of some help! I don't see any difference between the two forms except the spelling. 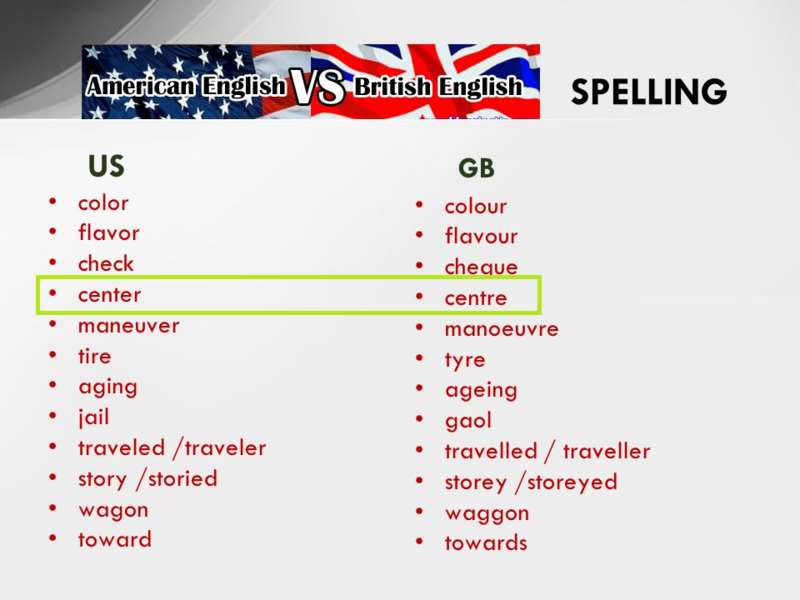 Center is commonly regarded as an American spelling, whereas in Britain, people tend to spell it as centre. This is similar to some words like meter and metre, color and colour, etc. The spelling centre is standard in UK English. In Canada it is typical in proper names, e.g. Toronto Centre for the Arts, but "center" is also commonly used otherwise, e.g. shopping center, center of town. Both spellings can be encountered even in the same text, e.g. in NHL hockey where there are many Canadian and US teams, reference might be made to the "center" forward position and a "centre" where a game is played. centre is the UK spelling for center. center is the US spelling for centre. Not the answer you're looking for? Browse other questions tagged word-usage word-difference spelling or ask your own question. Word choice: centring or centric? What's the difference between “flicker” and “twinkle”? Is there a difference between the words “concious” and “conscious” (and is the former even a word)? What's the difference between “go meet” and “go to meet”?